'Flat One' is a totally refurbished first floor apartment with lots of style and in a perfect location. The holiday home has a relaxing master double bedroom with tall ceilings, a bathroom with a walk in shower, wc and basin, modern kitchen to cook up Whitstable's famous seafood from the working Harbour, and a living room. The owner of the property enjoys getting away here too, to write her crime novels, The Whitstable Pearl Mysteries, so you will find some of her work on the shelves! She is also happy for you to use her private parking space throughout your stay - it's situated very close by. To make your break just that extra bit special, she provides tea, coffee, sugar, cookies and wine for her guests on arrival. Situated on Harbour Street, it is just a hundred paces from the beach and the famous Royal Native Oyster Stores restaurant. Across the street sits the quaint, gabled Tudor restaurant (favourite haunt of actor, Peter Cushing) serving English breakfast and afternoon teas. The Horsebridge Arts Centre, boutique shops, galleries, restaurants and pubs are all within easy walking distance. Everything for the perfect romantic break is right on your door step. 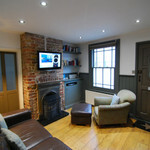 10% off if you book both Flat One Harbour Street and Rooftops above on the same dates.